If you often receive emails offering various online services or websites to contact for free wallpapers of your favorite stars, then you are no stranger to the digital world. With internet and electronic devices becoming increasingly vital in our lives, the need for digital marketing is also increasing. Today, businesses are using it for various purposes and it has a huge potential for anyone looking forward to choose a career in the industry. Until 2010, many businesses did not take it seriously, but today if you don’t have a digital marketing strategy and a strong online presence, then customers are most likely to shy away from you and avail services from your competitors. Presently marketing departments are integrating with online channels and with social networks, laptops and mobile devices, more and more new channels are connecting customers and the demand for digital marketing expertise is also increasing. SEO Manager: Joining a digital marketing course will often help you learn the search engine optimization techniques used to build traffic for business websites by leveraging referrals from major search engines that include Google, Yahoo and Bing. SEO managers are aware of latest analytical tools and are responsible for PPC advertising and Search Engine Marketing. Social media manager: Social media has become an integral part of every company’s promotional strategy and it helps to drive more than 80% traffic to the website. Proper training in this field will help candidates to develop strategies for the brand’s presence on social channels that includes Facebook, Twitter and etc. They help in developing campaigns, analyze results, interact with customers and create strategies accordingly. Marketing analyst: Analysts are people who use analytics tools to track the success of the digital campaigns. They are responsible for conducting market research and assisting other team members with data driven strategies to help the company enjoy greater revenues. Marketing assistants: They often help to create comprehensive online strategies for the company and develop plans that include online advertising, email or mobile marketing, social media and many more. They assist in a wide range of tasks from creating campaign reports to arranging promotional events. It offers a huge exposure to a wide range of skills that a manager should possess. Content developers: “Content is King” and a company has to keep online channels flushed with content like blogs, newsletters, videos and etc. Content managers help to manage teams of writers, designers, photographers and often develop strategies to publish business content online. a. Read and learn a lot: Since the digital market is growing very fast and is incredibly competitive, it is vital to know the basics, strategies, techniques and other aspects of the field. b. Select your interest: A thorough knowledge on all the arenas of this field is needed, but you have to specialize in a specific area as it will help you to get more job offers and become an expert. c. Meet industry experts: Surround yourself with people who are experts in this industry. The more you meet them or attend events or seminars, the more it will help to open doors to opportunities. d. Certification: If you want to stand out from your peers, then getting certified will help. The ability to analyze campaigns and understand the elements that work best requires specific skill sets that can be attained through proper training. 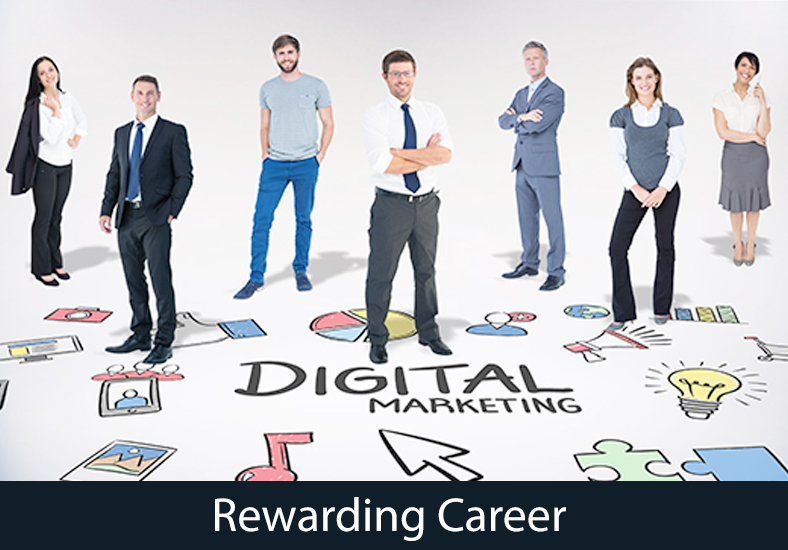 Thus to conclude, we can say that with lots of companies moving towards digital marketing, it is now a lucrative career with excellent long term prospects.